Sharpless 2-216 is the closest known planetary nebula and also one of the oldest. Its apparent size of 1.6 degrees is over five times bigger than the main shell of the Helix Nebula. Only its eastern rim is visible (barely) on the POSS. Sharpless 2-216 is probably unobservable, but you never know with guys around like Jay McNeil and Rich Jakiel. Using my 18" f/5 reflector and a 35mm Panoptic eyepiece, I swept the field of Sh2-216 and located the area of the bright eastern rim (based on the inspection of a RealSky image and Parker's Emission-Line Survey of the Milky Way. With no filtration the telescope revealed nothing unusual - only a fine Milky Way star field . I suspected that an [OIII] filter would be of use as the Parker book includes an image of this object in [OIII] light that shows a relatively bright glow. The addition of the [OIII] filter darkened the field from a luminous gray to black and I quickly spotted a dimly glowing vaguely defined filament about 45 arc minutes long and perhaps 20 minutes wide running north to south. 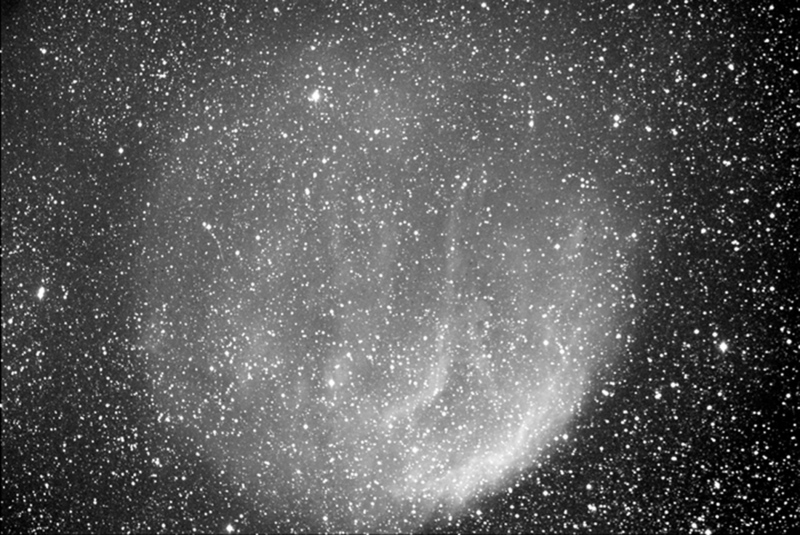 Rich Jakiel, my observing buddy that made the trip with me, thought the filament to be only 10 to 15 arc minutes wide. We carefully swept over the filament to the surrounding jet black sky and upon returning to the area of the filament would note a persisting glow in the same spot. I was still skeptical - it wasn't supposed to be this easy ! Removing the filter, I thought I might be seeing a Milky Way patch that would appear nebulous through the [OIII] filter - but in 'straight' light there was no clustering of stars to deceive us. I slowly accepted that the glow was the 'impossible' planetary and it was not the exceeding difficult (or invisible) object I had suspected it would be. I returned to the area again the next evening just to confirm my observations and try other filters on the planetary. Although this evening wasn't quite as transparent as the previous one, I again spotted the filament and I put my doubts to bed - Sh2-216 is in the realm of the visual amateur astronomer with a moderately large Dob and good skies.